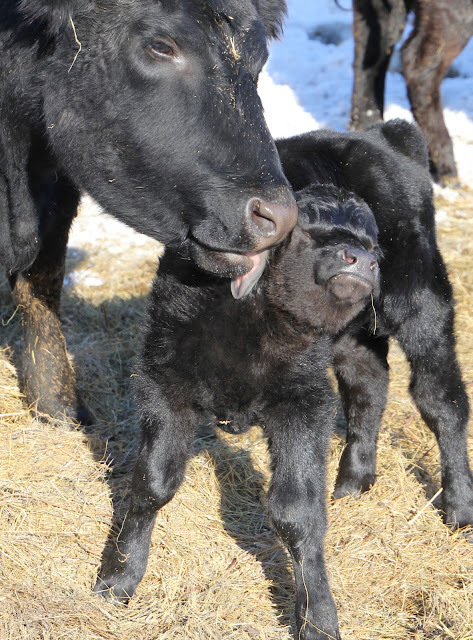 Wordless Wednesday - Baby Calves are Here! Awwww, come on Mom! Not in front of the guys! Sweet baby girl snuggling in the hay. Even the barn cat lazed in the sun today! The yearling bulls were feeling frisky--playing in the snow! Great pictures Debbie. I love how oversized the babies eartags look when they are that little. Hope your calving continues to go great. Awesome pics! LOVE the one of the cow licking the calf's face! Aww! These pictures are AWESOME! They make me want cows even MORE!! Awwww, Congrats! Love the pictures! I don't think I ever get tired of looking at baby calves they are just soo cute!! Our Calves were loving this beautiful sunshine we were having down here today! I hope your calving season goes good.